Lean Unit 6: Lean Design and Pre-construction is a half-day, instructor-led course that introduces you to the concepts of value-based management, lean in the design process and relational contracting. 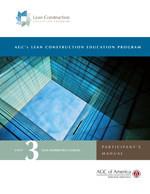 Applying lean concepts to design is a continuation of the lean concepts applied to construction. The lean concepts apply to design just as they apply to construction. The goal is to understand the design process to the extent we can help the design and pre-construction process mesh with the needs of lean construction. Architects, owners and the building industry have different views of design, and we need to develop a more common understanding to facilitate applying lean concepts to the design process. The ultimate goal is to reduce waste and increase value. Following this course, participants will be able to: o	Distinguish between the varying definitions for design. o	Define value and commonly used methods to maximize it. o	Discuss waste and commonly used methods to minimize it. o	Differentiate between traditional project methods and lean design. o	Explain the various lean tools used in design and how to deploy them. To gain credit for participation in this course it must be facilitated in-seat by an approved instructor. Visit www.agc.org/LCEP for more information.